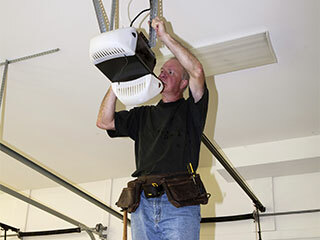 Home Our Garage Door Services Garage Door Openers When Should I Replace My Garage Door Opener? Since automatic garage doors are usually used at the very least twice a day, their moving parts, the opener included, can gradually develop a variety of different issues. Over time, your opener's ability to perform optimally will suffer, which can end up compromising several aspects of your door. New opener models are usually considered far safer than their old counterparts. Their photo-electric eyes are more durable and will become misaligned less easily. What's more, they usually employ some additional safety features in order to ensure your door panels don't end up hurting anyone, so upgrading your opener may be worth it for this reason alone. Chain-drive units, which are the older type of garage door openers, are by far the loudest ones. New models can be powered by either a belt drive or a screw drive system, which means they can be considerably quieter than previous options. This factor can be a great influencer for homeowners with a garage that's located near a bedroom. Garage doors are often used as the main entryway to the house. If their ability to remain secure is compromised, they can be exploited by burglars to gain access to your home. Many new opener models employ all sorts of security features that can help you prevent this. Rolling code technology, for example, makes sure the codes your opener and its remote use to communicate change after each time you use your door. This can prevent tech-savvy thieves from utilizing them to their benefit. Making sure you don't opt for some cheap substitute is very important, as the industry's leading garage door opener manufacturers provide reliable and long-lasting products with features that can greatly improve your day to day routine. Sears, Liftmaster, Genie, and Chamberlain are some of the leading brands out there, and their openers are considered by far some of the best options available on the market today. Contact our experts at Garage Door Repair Houston to have our professionals help you choose the perfect opener for you. We can perform the installation process quickly and effectively. Call us today.